Advertising flags come in all shapes and sizes, and have many uses. Most of these promotional banners come with custom printed graphics that are supplied by the customer. What exactly is an advertisement flag? Generally speaking, they are any type of banner that is used to promote a product or service. 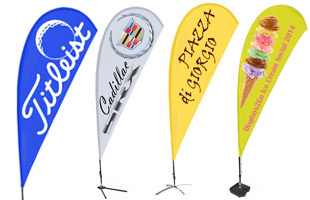 Advertising flags are also commonly used to announce an upcoming event such as a local festival or fair. Automotive dealers use these custom banners to inform customers where on the lot certain makes and models of cars are located. These flags for advertising are becoming and increasingly popular method of promoting among companies and large corporations. One of the popular product lines among the advertising flags, are message flags. These are pre-printed banners with stock text. These custom flags are typically seen outside establishments like restaurants, bars and small businesses. The message flags usually have one word printed on them in large text to announce a sale, or other important status. 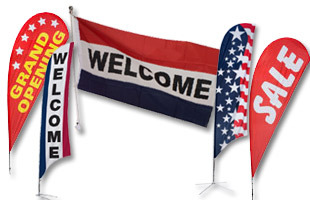 This product line currently features banners with the following words; "sale", "pizza", "welcome" or "open". 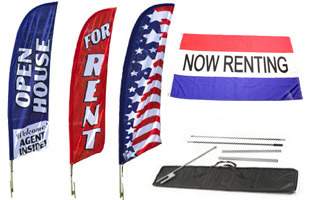 In addition, these advertising flags are currently offered with either a standard flag pole assembly, or as a feather-like banner and stand. The flag and pole assembly features a standard 5' x 3' flag in red, white and blue stripes with black text. The feather message flags include a 12' banner with a water base stand. These stands make a huge impact, as they blow freely in the wind. Customer's eyes will be drawn to the movement of these message flags. These flags for advertising are also sold separately, so buy one of each message, and change them out as necessary. Buy in bulk quantities for deeper discount pricing. Similar to the message flags are these feather flags with custom graphics. The shape of these custom banners resembles that of a bird feather. 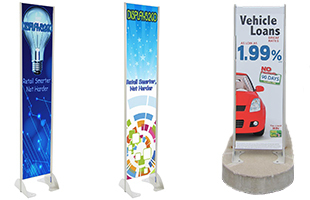 These advertising flags, also known as business banners, come in several sizes, and with a couple different base options. Choose from a water-fill base, a ground screw base, or a standard cross-type base. No matter what type of configuration is used, all of these feather flags will flow nicely in the wind without toppling over. The sizes available for these advertising flags range in size from a little over 10 feet tall, all the way up to a staggering 17 feet tall. Make a lasting impression with one of these giant outdoor displays. All of these custom banners are printed with graphics provided by the customer. There is a link to the template for each unit, simply download the template, and start creating your new advertising flags! 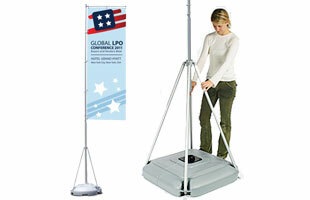 One of the more portable promotional flags in this product line is the fillable base unit. These feather banners feature a durable plastic base that has a fill hole so that water or sand can be added for extra weight and stability. All of these flags for advertising will surely grab the attention of curious pedestrians and other traffic passing by. Buy multiple units to create an even larger promotional tool. There are also ceiling hung advertising flags featured among this huge product line up. These custom promotional signs are large banners that are rigged from a ceiling. 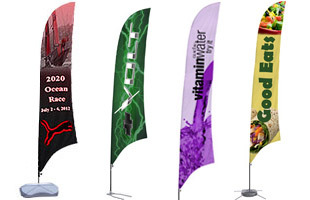 Typically, these advertising flags are seen in large convention centers, or at tradeshows. There are three shapes included in these ceiling banners; square, round and triangle. There are also different sizes available among the different promotional flags. Choose the best unit to suit the need at hand. These advertising flags enable the user to stand out among the competition in a large room. Assembly is simple, and can be completed by one person. Typically convention centers and large events contract workers with the appropriate equipment to suspend items from the overhead. These custom flags also include a carrying case to make transporting them a snap. 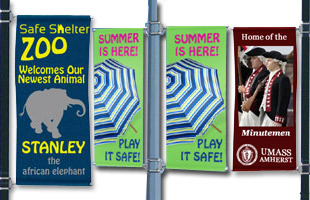 The latest product line to join this ever-expanding of products are the street pole banners. These custom displays are used everywhere! These lamppost signs are commonly seen on local city street poles, and at automotive dealers. Local municipalities tend to use this type of advertising flag as a seasonal decoration, or to announce a local event such as a 4th of July parade, or summer festival. Car dealerships use these custom flags to direct patrons to the correct spot on the lot for a certain make or model of car. Additionally, colleges and universities are starting to utilize flags to add some decoration to create a more appealing environment. These street light banners are offered in a few different sizes, as well as single and double-winged. The necessary pole and brackets are also included with every purchase, so that they are ready for mounting once received. If there is a need to make a huge impact with outdoor banners, these "giant pole" ensembles will certainly get the job done. These huge displays come in two different sizes; 13 feet and 17 feet tall. 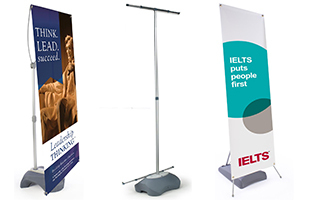 These promotional flag stands are commonly used at outdoor events such as a concert, theme park, or seasonal festival. Set up is fairly simple. There is little assembly required with these custom flags, and can be accomplished by one person. 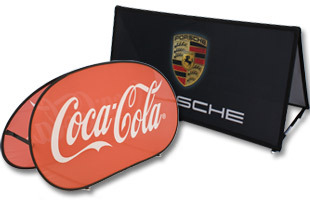 These promotional flags break down into a convenient carrying case that can be transported in any car trunk. There are also several printing options offered. Choose from single-sided reverse reading backside, double-sided right-reading backside, as well as custom digital print. Additionally, there are banners with one color, two color, three colors or full color imprinting options available. So, no matter what the need there is sure to be a custom flag option here for everyone. Click on the corresponding image above to learn more about the different types of products offered here. What are some of the benefits to using these custom flags? Many of these feather banners are used outdoors to create an enticing fixture to passersby. Some of these custom flags can be screwed into the ground or sand allowing for additional placement options. Promotional banners can be used to advertise a new product or upcoming event. What type of flag should I buy? Most of these banners are suitable for indoor or outdoor use, adding to their versatility. 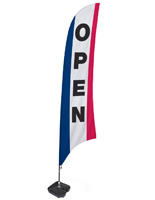 Message flags are perfect for a restaurant or local shop that doesn't have the budget for high-priced neon signage. Street pole banners are popular with automotive dealers for brand awareness, and local towns for seasonal decorations. Ceiling hung banners are suitable for large venues such as trade shows and other promotional events. There is a huge selection of other event displays available that coordinate well with the message banners featured here. Some of the many other products include, table covers, pop up displays, portable booth displays, tents, umbrellas, and much more! In business since 1974, our ever-expanding product lines include thousands of ready to ship items. Most orders ship within 24 hours of ordering. Orders can be placed through this secure website, or if preferred; a call center staff member can assist with placing an order. Displays2go is updated daily with new products and features, so be sure to check back often to see what's new. We are America's largest and trusted manufacturer of retail merchandising displays.